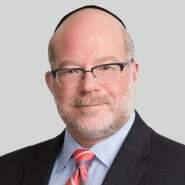 Jay Levine of the firm's Washington D.C. office, was quoted in a recent Policy and Regulatory Report article titled, "Humana/Aetna divestitures complicate DOJ's case, lawyers say." In the article, which is available to the site's subscribers only, Levine comments on how "litigating the fix" will make the DOJ's case to block the health insurance merger a "lot tougher." The article published on Aug. 30, 2016.